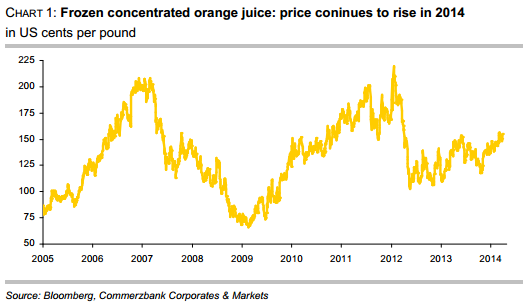 Orange juice: Will Brazil make up for the decline in US supply? In March, the New York Board of Trade price for frozen concentrated orange juice returned to levels of over 150 US cents per pound that were seen in early summer 2013. In October, prices had temporarily dipped below 120 US cents per pound. The fact that prices have increased again is mainly attributable to the drought in Brazil that raised doubts as to whether an increasing Brazilian production could really offset the losses in the US. The USDA has repeatedly made it clear that in the USA declining supply of oranges and orange juice has to be expected for the 2013/14 season. In the US, orange production is concentrated in only two states. Some 70% of oranges originate from Florida, while everything else – except for a negligible rest – comes from California. For this reason the USDA’s announcement that this year production in Florida will probably fall to the lowest level since 1990 has moved the market. A 15% drop on last year is expected. The main reason is that the bug-transmitted disease citrus greening has caused considerable damage to trees. This disease prevents sufficient nutrient uptake and thus stunts the growth of the fruit, causing it to drop prematurely. This season in Florida, the loss rate from droppage should be the highest in 50 years. Since the development of new plantations is expensive and the young trees have to be grown in a greenhouse to prevent infection, the orange plantation acreage in Florida has fallen to the lowest levels since records began in 1978. In Florida, the orange harvest is traditionally used almost completely for processing into juice. In California, the share of oranges for direct consumption is higher. But since this year the citrus greening will probably make a lot of fruit unsuitable for direct consumption, the share of juice processing will likely be higher than usual this year (chart 2). In the US, the downward trend in production therefore probably continues: The USDA’s latest forecast from January expects a drop by 11% for both orange and orange juice production. Besides the citrus greening, the aridity in the US plays a role here: Whilst in the winter months the US Drought Monitor rated 28% of Florida as abnormally dry, moisture conditions are now classified as nearly 100% normal. Not so in California, where about half of the acreage is currently affected by extreme drought and another fourth suffers from an exceptional drought. With regard to global production, the USDA is more optimistic: In January, it estimated that orange production in Brazil would rise by 8.5% in the coming harvest from May onwards due to bigger fruits. While the USDA counts this harvest for the 2013/14 season, in Brazil it is already counted as the crop of 2014/15. The production of orange juice is seen to increase even more strongly (18%) in the USDA report, as the yield from pressing is improved. But these impressive growth rates should not make us forget that in the previous season both orange production and orange juice production fell significantly, by 20% and 23%, respectively. Already in 2011/12, production had decreased. The orange acreage has been reduced in Brazil in the last few years – the world’s biggest orange producer by far with a share of more than one third and no. 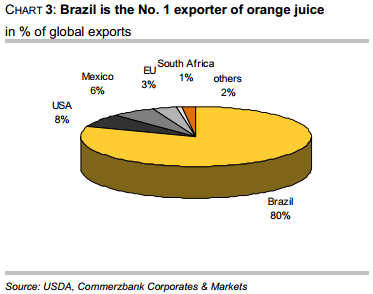 1 exporter of orange juice (chart 3) – as many growers shifted to products such as soybeans, corn or sugar cane. Whether the effects of the drought on production in Brazil makes USDA forecast unrealistic, is still unclear. Due to favourable weather, a whopping 12% increase in orange production is expected in the EU, which would mean a return roughly to 2008/09 levels after years of a steady decline. Juice production is seen to increase at an equally quick pace. The EU is also the biggest importer of orange juice, with a large part of its imports coming from Brazil and the US, whereas South Africa and Egypt are the most important sources for fresh fruit. In China, production of orange juice shall also continue rising, with the level expected to quadruple compared to 2010/11. But since demand likewise continues to grow, the country still has to rely on imports. About half of the consumed quantity must be imported. But this corresponds to only 0.5% of the globally traded quantity of orange juice. China is still a negligible client compared to the EU, which accounts for half of the total import volume and imports eleven times as much as China. 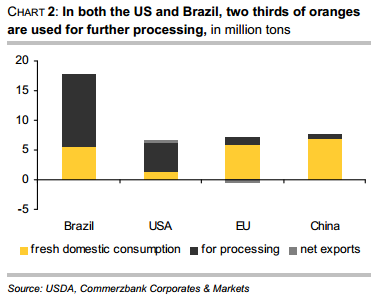 Compared to the previous season, the increase in oranges as well as orange juice in Brazil and several other countries is expected to more than offset the considerable decrease in the US, and so the USDA reckons with a global growth of 5% in orange production and of 6% in orange juice production. In recent years, the per-capita consumption of orange juice in the US has declined considerably as many consumers prefer beverages with lower sugar contents. In the EU, the biggest consumer of orange juice, consumption is also considerably lower now than it was only a few years ago. Since these two regions account for two thirds of global orange juice consumption, prospects are rather cloudy on the demand side. However: The unsolved problems with the citrus greening and concerns about the consequences of the drought in Brazil should support orange juice prices for the time being.